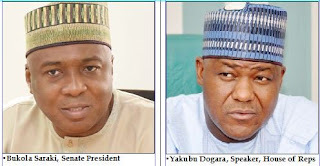 The Federal High Court, Abuja, yesterday gave Senate President, Bukola Saraki; Speaker, House of Representstives, Yakubu Dogara; and 52 other lawmakers until April 17 to file their responses to a suit asking them to vacate their seats. An advocacy group, Legal Defence and Assistance Project (LEDAP), dragged the lawmakers to court seeking a declaration that they were no longer members of the National Assembly having defected to other political parties before the expiration of their tenure. The defendants comprise 17 senators, 37 members of the House of Representatives, the Independent National Electoral Commission, the Attorney-General of the Federation and the clerks of both houses. When the matter was called, Mr Efut Okoi announced appearance for the senate and the senators, while Safiya Mohammed announced appearance for the members. Both counsel urged the court to entertain their applications, noting that a litigant’s choice of counsel was his fundamental right. Mr Jubrin Okutepa (SAN), who announced appearance for LEDAP, said that the defendants were attempting to confuse the court by changing counsel. He noted that at Thursday’s proceedings, Mr Mahmud Magaji, SAN, announced appearance for all the defendants and wondered why that had changed. He urged the court to ask Magaji to move the applications he had earlier filed and strike out any other applications before the court with regards to the suit. Magaji, in one of his applications, challenged the jurisdiction of the court to hear the matter on the grounds that the plaintiff had no “locus standi” to file the suit. The trial judge, Justice Okon Abang, however, held that it was in the interest of justice to hear all counsel in the matter. He ruled that the plaintiff (LEDAP) was at liberty to reply to all the processes filed by the defendants on or before April 15 and ordered the defendants to file their reply by April 17. He said that any party that failed to abide by the court ‘s directive would have itself to blame. The judge adjourned the matter until April 18. The court on Thursday suspended delivering judgment on the suit, even though the judge said it was ready, in order to give the defendants an opportunity to file their processes so as to give all parties in the suit fair hearing. LEDAP, in their suit filed on September 14, 2018 prayed the court for an interpretation of Section 68(1)(g) of the 1999 Constitution. This was with regards as to whether any member of the National Assembly who resigns from the political party that sponsored his election before the expiration of the term for which he was elected, automatically loses his seat in the assembly. The group was also seeking a declaration that the lawmakers were no longer entitled to receive any remunerations due to a member of the National Assembly and that any of such remunerations after their date of defection be refunded to the Federal Government.